The #OpenBadges Backpack: an obstacle to innovation? Conclusion: The Open Badges backpack was structured around the concept of equity, personal data ownership, and interoperability. It discouraged siloing of learning recognition and encouraged personal agency. It is difficult to recognise, in its current implementation, the initial intention of the Open Badge Infrastructure designers as stated by Carla Casilli: the Backpack has become the pivotal element of a flawed infrastructure based on a profound asymmetry between (institutional) issuers and (individual) earners. The Backpack is the expression of a world where learners are valued as the subservient actors of a system where their only real power is to say NO! to a badge. “Personal agency” is not related to having the ability to accept/refuse, show/hide badges based on externally defined criteria (which is what one can do with the backpack) but to the ability to define one’s own identity independently from any institutionally defined standards. A true sense of “personal agency” would require the ability for learners to formulate their own claims regarding their identity and not simply be allowed to pick and choose through predefined institutional pathways. Far from encouraging innovation and personal agency the Backpack has now become an obstacle to innovation and personal agency. The current work engaged by Mozilla to “fix” a number of the Backpack’s current problems does not appear to be interested in addressing the systemic flaws embedded in the Backpack, but just to making them less painful to the compliant user. Imagine a world of formal education where it is not the teacher who issues badges to learners, but learners who issue (or endorse) badges to other learners, teachers and more generally to any entity having contributed to their learning: “here by, I recognise your contribution to my learning.” Imagine a world where learners formulate their own claims, design their own badges and ask others to either issue or endorse them. In such a world, the current Backpack would have no place. The Backpack has not much value in the space of informal learning either, a domain where peer recognition plays a central role. Of course, if we decided that only formal recognition of informal learning had the right to exist, then the current Backpack might still retain some currency. On the other hand, if we believe that what is needed is an environment where informal recognition of informal learning should be encouraged and valued, then the Backpack is not only unhelpful but an obstacle. The Backpack enforces the idea that learners are at the end of a value chain in which they do not have their say. As explained by a number of authors, Open Badges are “credentials,” and to have value, they need to be delivered by a “credible authority” — BTW, badge issuers are NOT required to have their own backpack to establish their credentials! Now, imagine that instead of “credentials” we define Open Badges as claims. Claims can be made by anybody, not just credible authorities. I have the right to claim “I’m a plumber”, then ask others to endorse that claim. An entity credits another entity for certain qualities. Peer and other entities endorse (or not) the claim. Such a conversational system is only possible if participants have the means to formulate their own claims, something the Backpack has not been designed for. 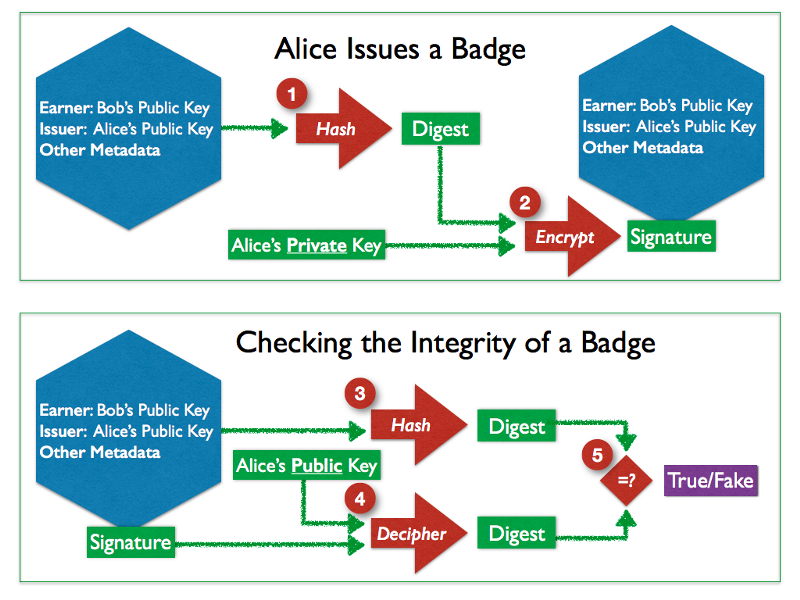 The Open Badge infrastructure was not designed to support authentic personal agency, but “agency by (institutional) proxy” the institution issuing credentials and the institution storing credentials (Mozilla for the Backpack). The solution to make Open Badges fully verifiable and independent from any dedicated storage exists and is called signed badges. Providing the means for everybody to issue signed badges and a mechanism to endorse them would allow anybody to formulate claims (embedded in a badge) and seek endorsements from peers and other entities. Some might claim that signed badges would require a more sophisticated technology, like cryptography and a public key infrastructure (PKI), but isn’t this precisely what the blockchain technology uses and what makes it so powerful? Why not provide every member of the Open Badge community with the means to create claims and credentials, sign them (to make them verifiable) and invite others to endorse them (the “earner” of an endorsement can be a claim or a credential) and in doing so create bottom-up trust networks. For those reasons, it is urgent to state clearly that the time of a world where individuals have only the right to beg for and store badges is over. While the Backpack was a nice prototype, it has now become an obstacle to technical and pedagogical innovation— it can still be useful to those only interested in using Open Badges as the Botox of education! It is time to make the Open Badges’ initial promises a reality. The work for the Open Badge specifications 2.0, the Open Badge Passport (also here), Badgr and the BadgeChain should provide major contributions to achieving that goal.